This is the perfect choice for those looking for a high quality motocross, off-on road, or ATV helmet/goggle combo at an affordable price. Please measure for size. Each manufacturers sizing is different. To measure, gather the circumference of the largest part of your head, usually just above the eyebrows. SMALL: 22" to 22 ½"
MEDIUM: 22 ½" to 23"
LARGE: 23" to 23 ½"
XL: 23 ½" to 24"
XXL: 24" to 24 ½"
Head shapes can affect how a helmet fits. The size chart is meant to be a starting point. 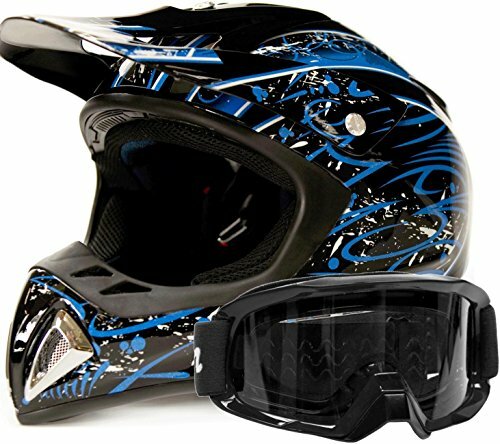 This adult off road goggle combo is loaded with features! PLEASE MEASURE & CHECK YOUR SIZE BASED ON OUR SIZE CHART BEFORE ORDERING (Sizes vary by brand) SIZE CHART (Circumference of the largest part of your head, usually just above the eyebrows) in inches SMALL: 22 to 22 ½ - MEDIUM: 22 ½ to 23 - LARGE: 23 to 23 ½ - XL: 23 ½ to 24 - XXL: 24 to 24½. ; (Circumference of the largest part of the head, just above the eyebrows, above the ears, and around the largest point at the back of the head). Do not pull the tape (or string) tight, leave a little slack. If you have any questions about this product by Typhoon Helmets, contact us by completing and submitting the form below. If you are looking for a specif part number, please include it with your message.